PHOTOS: DON SCOTT Rastus the cat and his owner, Max Corkill, approach Christchurch during their fundraising tour of New Zealand in October 1995. 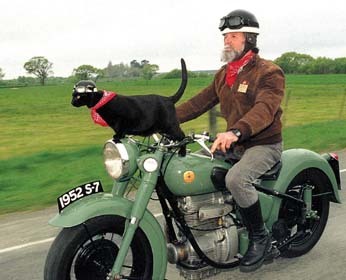 Januari 20, 1998, New Zealand, National biker-cat celebrity Rastus, his owner, Max Corkill, and pillion passenger Gaynor Martin have been killed in a head-on crash in North Taranaki. At 9.30am Mr Corkill, 58, Ms Martin, 48, and Rastus, all from New Plymouth, died instantly in a collision with a car on State Highway 3 just north of Urenui, 32km north-east of New Plymouth. Rastus and Mr Corkill were media and charity stars, most recently featuring in a prize-winning Bell Tea television advertisement. Rastus and Mr Corkill had clocked up many thousands of kilometres on Canadian and New Zealand roads together since Mr Corkill befriended the tiny kitten dumped at a bikers' swap-meet in Canada. Rastus had his own fan club of more than 200 and was a major fundraiser for the Royal New Zealand Society for the Prevention of Cruelty to Animals. The duo had their own company which sold Rastus collectables such as T-shirts, posters, and badges, and even had a joint cheque account. Rastus signed with a paw print. After more than 30 years in Canada Inglewood-born Mr Corkill returned to live with his elderly mother in New Plymouth in 1994.The pair were often seen on the roads, Rastus perched on the petrol tank of Mr Corkill's motorcycle leaning into the wind. Rastus had special helmets to suit the occasion. He wore a red hat with antlers for Christmas and Mr Corkill dressed up as Santa Claus. 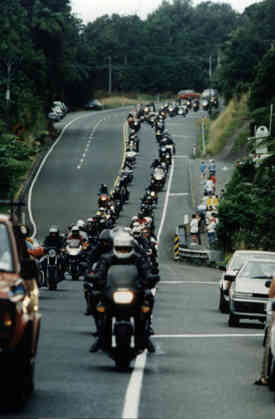 Hundreds of bikers escorted Max and Rastus on their last tour.